Autograph Collection Hotels, Marriott International’s diverse and dynamic portfolio, has announced plans to welcome 12 one-of-a-kind hotels to its European portfolio this year, each hand-selected for their distinct perspective on design and hospitality. Hotels set to debut as part of Autograph Collection Hotels this year, include: Aegon, Mykonos, a stunning beach resort complete with harmonious spa and private beach club; Hotel Universo, a sixteenth-century palace in the medieval walled city of Lucca near Florence; Schloss Lieser, a fairy-tale castle in Germany’s Moselle region, an idyllic landscape famed for its wine-growing; Academia of Athens in Greece, with design inspired by Greek Philosopher Plato; and The Shelbourne, the enduringly iconic hotel that’s been at the heart of Dublin society since opening in 1824. Each hotel truly is a product of passion and a personal realisation of its individual founder’s vision, making each one singular and special: Exactly Like Nothing Else. Launched in 2010, the hotel brand has become a pioneer in the independent hotel space and has rapidly grown from five hotels to more than 160 in nine years. Continuing to grow around the globe, Autograph Collection’s global pipeline comprises nearly 100 properties. At a time when Booking.com revealed that 53 per cent of global travellers plan to take more weekend trips in 2019, Autograph Collection Hotels is offering travellers rich immersive moments that leave a lasting imprint, with five restored architectural gems slated to join Autograph Collection Hotels in Europe this year. Exemplified by the latest addition to Autograph Collection’s portfolio of London hotels, The Dixon – just opened in January – was originally designed as a Magistrates’ Court and police station in 1905 by John Dixon Butler. The building has undergone extensive restoration to restore its original features, including its spectacular grand courthouse. A stunning interior design concept showcases the hotel’s passion for art with curated artworks set against a backdrop of contemporary and heritage design. Autograph Collection hotels advocate for the original and individual through unique perspectives on design, enabling travellers to make a serious travel statement, even on the shortest of getaways. Academia of Athens, set to become Autograph Collection’s third property in Greece when it opens later this year, is inspired by its namesake, historical landmarks and the vibrant culture of the contemporary city. Global design and architectural firm HOK juxtaposes the heritage of the city of Athens with a bold and modern exterior. Inside there are visual cues from ancient Greek scholar Plato’s Three Orders; Science, Philosophy and Arts, with each principle brought to life throughout various spaces within the hotel. Autograph Collection Hotels is set to continue adding to its existing roster of 47 properties across 17 countries in Europe, with new destinations that provide one-of-a-kind hotel stays for even the most discerning global traveller. Ten of the 12 planned openings in 2019 will mark the brand’s debut in new cities and resort destinations, offering more choice and trip inspiration than ever before. New destinations include Lieser, Germany; Athens and Mykonos, Greece; Lucca, Italy; Montreux, Switzerland; Paris and Reims, France; and Seville, Spain. The planned opening of Sapphire House late in 2019 in the vibrant city of Antwerp will mark Marriott International’s first hotel in the city. Expected to provide travellers with insight into the city’s traditions and fascinating past in gem-trading, Sapphire House will invite guests to discover the quirks of this inconspicuous destination. 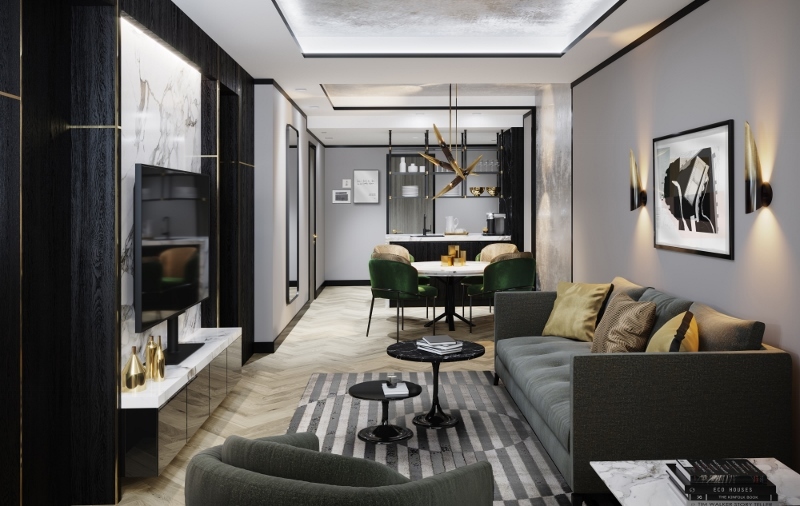 Occupying the site of the city’s original Royal Exchange, known as Den Grooten Robijn (The Great Ruby), Sapphire House will be a stunning addition to Antwerp’s boutique hotel scene. Ensuring every stay is unique, Autograph Collection Hotels’ handpicked portfolio of properties each offer their own unique ‘Mark’ – a signature moment within the hotel that is bespoke for each property and enhances the guest experience. No two hotels share the same story and therefore none share the same Mark. Scheduled to join the brand in autumn 2019, Hotel Querencia de Seville, in the Old Town of Seville will perfectly represent the Mark concept. The hotel’s unique offering of music, arts, crafts, creative gatherings and artisanal workshops will bring a flare of Spanish craftmanship and everyday life to visitors, guaranteeing guests a genuine cultural experience. The anticipated spring opening of La Caserne Chanzy in the heart of Reims will provide guests with an immersive environment to explore the gastronomy of Reims. A restored firehouse will be transformed into a new restaurant – La Grande Georgette – offering reinvented local gastronomy, signature dishes and cocktails using evocative smoke, and even a food truck fashioned from an old fire engine.